Tables A and B in the supplementary appendix show the baseline characteristics of the participants by categories of cheese and fermented milk products (yogurt and other soured milk products). The distribution of the covariates displayed a similar pattern to that of milk intake categories. In a sensitivity analysis, the risk estimates of the outcomes associated with consumption of cheese or fermented milk products were in the opposite direction of estimates associated with milk consumption. Thus women with a high intake of cheese or fermented milk products compared with women with low intakes had lower mortality and fracture rates (see supplementary tables C and D). For each serving the rate of mortality and hip fractures was reduced by 10-15% (P<0.001). Risk reductions in men, based on a single exposure assessment, were more modest or were non-existent (see supplementary tables C and D). Contributors: KM and LB designed the study and drafted the manuscript. KM and LB analysed the data. LB, HM, SL, SB, EWL, and AW contributed to the interpretation of the data and revision of the manuscript. KM had primary responsibility for final content and acts as guarantor. All authors read and approved the final manuscript. The funders of the study had no role in the study design, data collection, data analysis, data interpretation, writing of the report, or the decision to submit the article for publication. Funding: This study was supported by grants from the Swedish Research Council. EWL is employed by the Swedish National Food Agency. The views in this article do not necessarily represent those of the agency. Ethical approval: The Swedish Mammography Cohort, the clinical subcohort of the Swedish Mammography Cohort, and the Cohort of Swedish Men were approved by the regional research ethics board at Karolinska Insitutet. 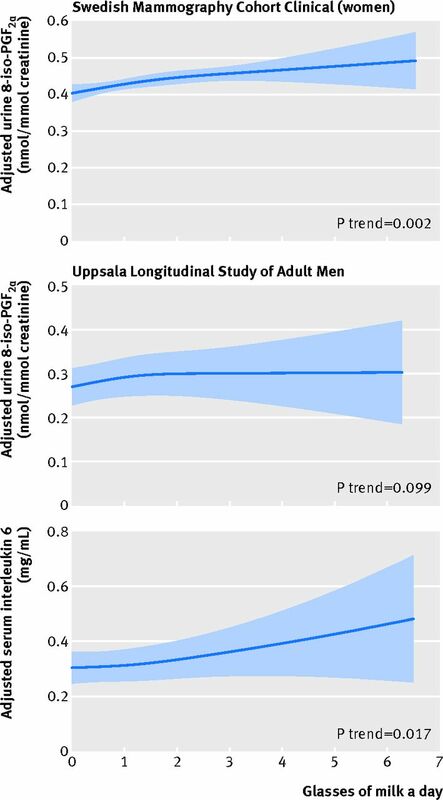 The Uppsala Longitudinal Study of Adult Men was approved by the regional research ethics board at Uppsala University. All participants gave informed consent. 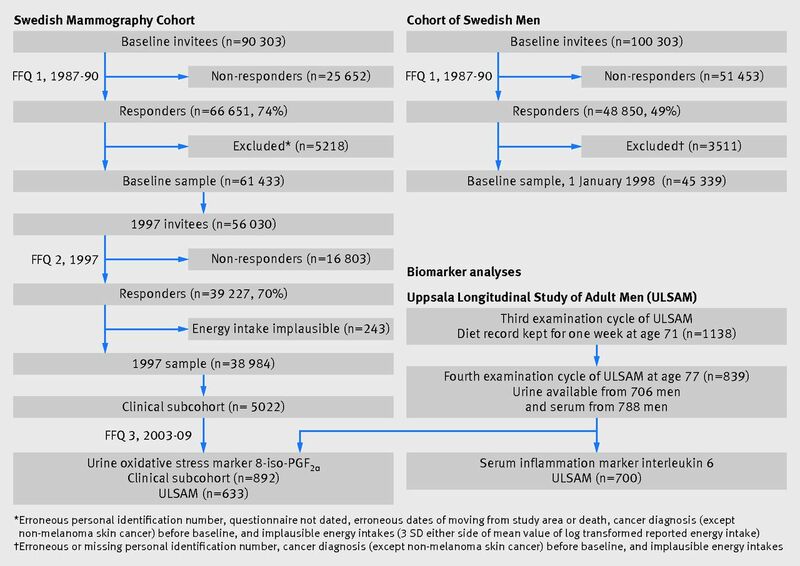 Data sharing: Summary data from the Uppsala Longitudinal Study of Adult Men are available at http://www.pubcare.uu.se/ULSAM. Transparency: The lead author (KM) affirms that the manuscript is an honest, accurate, and transparent account of the study being reported; that no important aspects of the study have been omitted; and that any discrepancies from the study as planned (and, if relevant, registered) have been explained. Burger J, Kirchner M, Bramanti B, Haak W, Thomas MG. Absence of the lactase-persistence-associated allele in early Neolithic Europeans. Proc Natl Acad Sci U S A2007;104:3736-41. Simoons FJ. The geographic hypothesis and lactose malabsorption. A weighing of the evidence. Am J Dig Dis1978;23:963-80. Heaney RP. Dairy and bone health. J Am Coll Nutr2009;28(Suppl 1):82S-90S. Song X, Bao M, Li D, Li YM. Advanced glycation in D-galactose induced mouse aging model. Mech Ageing Dev1999;108:239-51. Cui X, Zuo P, Zhang Q, Li X, Hu Y, Long J, et al. Chronic systemic D-galactose exposure induces memory loss, neurodegeneration, and oxidative damage in mice: protective effects of R-alpha-lipoic acid. J Neurosci Res2006;83:1584-90. Hao L, Huang H, Gao J, Marshall C, Chen Y, Xiao M. The influence of gender, age and treatment time on brain oxidative stress and memory impairment induced by d-galactose in mice. Neurosci Lett2014;571C:45-9. Cui X, Wang L, Zuo P, Han Z, Fang Z, Li W, et al. D-galactose-caused life shortening in Drosophila melanogaster and Musca domestica is associated with oxidative stress. Biogerontology2004;5:317-25. Reuter S, Gupta SC, Chaturvedi MM, Aggarwal BB. Oxidative stress, inflammation, and cancer: how are they linked? Free Radic Biol Med2010;49:1603-16. Manolagas SC, Parfitt AM. What old means to bone. Trends Endocrinol Metab2010;21:369-74. Michaëlsson K, Wolk A, Byberg L, Ärnlöv J, Melhus H. Intake and serum concentrations of alpha-tocopherol in relation to fractures in elderly women and men: 2 cohort studies. Am J Clin Nutr2014;99:107-14. Soedamah-Muthu SS, Ding EL, Al-Delaimy WK, Hu FB, Engberink MF, Willett WC, et al. Milk and dairy consumption and incidence of cardiovascular diseases and all-cause mortality: dose-response meta-analysis of prospective cohort studies. Am J Clin Nutr2011;93:158-71. Kanis JA, Johansson H, Oden A, De Laet C, Johnell O, Eisman JA, et al. A meta-analysis of milk intake and fracture risk: low utility for case finding. Osteoporos Int2005;16:799-804. Bischoff-Ferrari HA, Dawson-Hughes B, Baron JA, Kanis JA, Orav EJ, Staehelin HB, et al. Milk intake and risk of hip fracture in men and women: a meta-analysis of prospective cohort studies. J Bone Miner Res2011;26:833-9. Alm L. Effect of fermentation on lactose, glucose, and galactose content in milk and suitability of fermented milk products for lactose intolerant individuals. J Dairy Sci1982;65:346-52. Portnoi PA, MacDonald A. Determination of the lactose and galactose content of cheese for use in the galactosaemia diet. J Hum Nutr Diet2009;22:400-8. Kumar M, Kumar A, Nagpal R, Mohania D, Behare P, Verma V, et al. Cancer-preventing attributes of probiotics: an update. Int J Food Sci Nutr2010;61:473-96. Nestel PJ, Mellett N, Pally S, Wong G, Barlow CK, Croft K, et al. Effects of low-fat or full-fat fermented and non-fermented dairy foods on selected cardiovascular biomarkers in overweight adults. Br J Nutr2013:110:2242-9. Sonestedt E, Wirfalt E, Wallstrom P, Gullberg B, Orho-Melander M, Hedblad B. Dairy products and its association with incidence of cardiovascular disease: the Malmo diet and cancer cohort. Eur J Epidemiol2011;26:609-18. Ceapa C, Wopereis H, Rezaiki L, Kleerebezem M, Knol J, Oozeer R. Influence of fermented milk products, prebiotics and probiotics on microbiota composition and health. Best Pract Res Clin Gastroenterol2013;27:139-55. Sommer F, Backhed F. The gut microbiota—masters of host development and physiology. Nat Rev Microbiol2013;11:227-38. McNulty NP, Yatsunenko T, Hsiao A, Faith JJ, Muegge BD, Goodman AL, et al. The impact of a consortium of fermented milk strains on the gut microbiome of gnotobiotic mice and monozygotic twins. Sci Transl Med2011;3:106ra06. Astrup A. Yogurt and dairy product consumption to prevent cardiometabolic diseases: epidemiologic and experimental studies. Am J Clin Nutr2014;99:1235S-42S. Patterson E, Larsson SC, Wolk A, Akesson A. Association between dairy food consumption and risk of myocardial infarction in women differs by type of dairy food. J Nutr2013;143:74-9. Huth PJ, Park KM. Influence of dairy product and milk fat consumption on cardiovascular disease risk: a review of the evidence. Adv Nutr2012;3:266-85. Warensjö E, Byberg L, Melhus H, Gedeborg R, Mallmin H, Wolk A, et al. Dietary calcium intake and risk of fracture and osteoporosis: prospective longitudinal cohort study. BMJ;342:d1473. 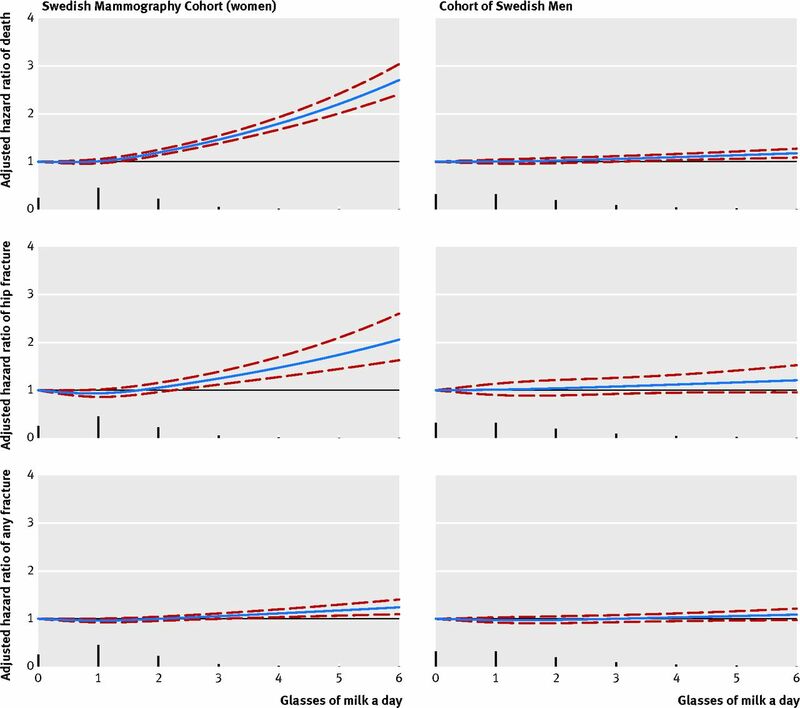 Michaëlsson K, Melhus H, Warensjö Lemming E, Wolk A, Byberg L. Long term calcium intake and rates of all cause and cardiovascular mortality: community based prospective longitudinal cohort study. BMJ2013;346:f228. Thomas LD, Michaelsson K, Julin B, Wolk A, Akesson A. Dietary cadmium exposure and fracture incidence among men: a population-based prospective cohort study. J Bone Miner Res2011;26:1601-8. Larsson SC, Bergkvist L, Wolk A. Long-term dietary calcium intake and breast cancer risk in a prospective cohort of women. Am J Clin Nutr2009;89:277-82. Bergström L, Kylberg E, Hagman U, Eriksson H, Bruce Å. The food composition database KOST: the National Food Administration’s information system for nutritive values of food [Swedish]. Vår föda1991;43:439-47. Willett WC, Howe GR, Kushi LH. Adjustment for total energy intake in epidemiologic studies. Am J Clin Nutr1997;65(4 Suppl):1220S-28S; discussion 29S-31S. 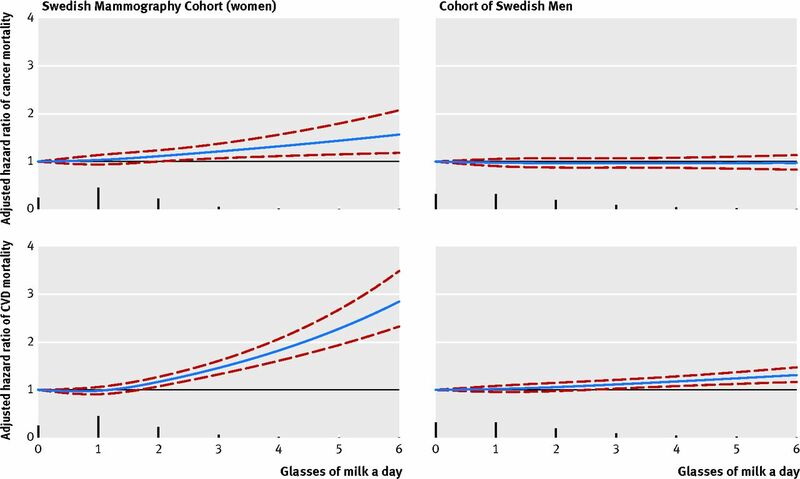 Larsson SC, Andersson SO, Johansson JE, Wolk A. Cultured milk, yoghurt, and dairy intake in relation to bladder cancer risk in a prospective study of Swedish women and men. Am J Clin Nutr2008;88:1083-7. Jiang J, Wolk A, Vessby B. Relation between the intake of milk fat and the occurrence of conjugated linoleic acid in human adipose tissue. Am J Clin Nutr1999;70:21-7. Wolk A, Vessby B, Ljung H, Barrefors P. Evaluation of a biological marker of dairy fat intake. Am J Clin Nutr1998;68:291-5. Gedeborg R, Engquist H, Berglund L, Michaelsson K. Identification of incident injuries in hospital discharge registers. Epidemiology2008;19:860-7. Sanders KM, Pasco JA, Ugoni AM, Nicholson GC, Seeman E, Martin TJ, et al. The exclusion of high trauma fractures may underestimate the prevalence of bone fragility fractures in the community: the Geelong Osteoporosis Study. J Bone Miner Res1998;13:1337-42. Mackey DC, Lui LY, Cawthon PM, Bauer DC, Nevitt MC, Cauley JA, et al. High-trauma fractures and low bone mineral density in older women and men. JAMA2007;298:2381-8. Orsini N, Bellocco R, Bottai M, Hagstromer M, Sjostrom M, Pagano M, et al. Validity of self-reported total physical activity questionnaire among older women. Eur J Epidemiol2008;23:661-7. Quan H, Sundararajan V, Halfon P, Fong A, Burnand B, Luthi J, et al. Coding algorithms for defining comorbidities in ICD-9-CM and ICD-10 administrative data. Med Care2005;43:1130-9. Michaëlsson K, Lithell H, Vessby B, Melhus H. Serum retinol levels and the risk of fracture. N Engl J Med2003;348:287-94. Basu S, Michaëlsson K, Olofsson H, Johansson S, Melhus H. Association between oxidative stress and bone mineral density. Biochem Biophys Res Commun2001;288:275-9. STATA Corporation. Stata reference manual, release 11. In: Stata Corporation, ed. Stata Press, 2009. VanderWeele TJ, Hernan MA, Robins JM. Causal directed acyclic graphs and the direction of unmeasured confounding bias. Epidemiology2008;19:720-8. Lin DY. Non-parametric inference for cumulative incidence functions in competing risks studies. Stat Med1997;16:901-10. Lau B, Cole SR, Gange SJ. Competing risk regression models for epidemiologic data. Am J Epidemiol2009;170:244-56. Tornkvist A, Glynn A, Aune M, Darnerud PO, Ankarberg EH. PCDD/F, PCB, PBDE, HBCD and chlorinated pesticides in a Swedish market basket from 2005—levels and dietary intake estimations. Chemosphere2011;83:193-9. Tahvonen R, Kumpulainen J. Lead and cadmium contents in milk, cheese and eggs on the Finnish market. Food Addit Contam1995;12:789-98. Gaucheron F. Milk and dairy products: a unique micronutrient combination. J Am Coll Nutr2011;30(5 Suppl 1):400S-9S. Louie JC, Flood VM, Hector DJ, Rangan AM, Gill TP. Dairy consumption and overweight and obesity: a systematic review of prospective cohort studies. Obes Rev2011;12:e582-92. Mozaffarian D, Hao T, Rimm EB, Willett WC, Hu FB. Changes in diet and lifestyle and long-term weight gain in women and men. N Engl J Med2011;364:2392-404. Abargouei AS, Janghorbani M, Salehi-Marzijarani M, Esmaillzadeh A. Effect of dairy consumption on weight and body composition in adults: a systematic review and meta-analysis of randomized controlled clinical trials. Int J Obes (Lond)2012;36:1485-93. Chen M, Pan A, Malik VS, Hu FB. Effects of dairy intake on body weight and fat: a meta-analysis of randomized controlled trials. Am J Clin Nutr2012;96:735-47. Hegsted DM. Fractures, calcium, and the modern diet. Am J Clin Nutr2001;74:571-3. Segall JJ. Hypothesis: is lactose a dietary risk factor for ischaemic heart disease? Int J Epidemiol2008;37:1204-8. Song Y, Chavarro JE, Cao Y, Qiu W, Mucci L, Sesso HD, et al. Whole milk intake is associated with prostate cancer-specific mortality among U.S. male physicians. J Nutr2013;143:189-96. Lampe JW. Dairy products and cancer. J Am Coll Nutr2011;30(5 Suppl 1):464S-70S. Timpson NJ, Brennan P, Gaborieau V, Moore L, Zaridze D, Matveev V, et al. Can lactase persistence genotype be used to reassess the relationship between renal cell carcinoma and milk drinking? Potentials and problems in the application of Mendelian randomization. Cancer Epidemiol Biomarkers Prev2010;19:1341-8. Corella D, Arregui M, Coltell O, Portoles O, Guillem-Saiz P, Carrasco P, et al. Association of the LCT-13910C>T polymorphism with obesity and its modulation by dairy products in a Mediterranean population. Obesity (Silver Spring)2011;19:1707-14. Wagh K, Bhatia A, Alexe G, Reddy A, Ravikumar V, Seiler M, et al. Lactase persistence and lipid pathway selection in the Maasai. PLoS One2012;7:e44751. Östman B, Michaëlsson K, Helmersson J, Byberg L, Gedeborg R, Melhus H, et al. Oxidative stress and bone mineral density in elderly men: antioxidant activity of alpha-tocopherol. Free Radic Biol Med2009;47:668-73. IL6R Genetics Consortium Emerging Risk Factors Collaboration, Sarwar N, Butterworth AS, Freitag DF, Gregson J, Willeit P, et al. Interleukin-6 receptor pathways in coronary heart disease: a collaborative meta-analysis of 82 studies. Lancet2012;379:1205-13. Clowes JA, Riggs BL, Khosla S. The role of the immune system in the pathophysiology of osteoporosis. Immunol Rev2005;208:207-27. Nestel PJ, Mellett N, Pally S, Wong G, Barlow CK, Croft K, et al. Effects of low-fat or full-fat fermented and non-fermented dairy foods on selected cardiovascular biomarkers in overweight adults. Br J Nutr2013;110:2242-9. Gross KC, Acosta PB. Fruits and vegetables are a source of galactose: implications in planning the diets of patients with galactosaemia. J Inherit Metab Dis1991;14:253-8. Jumbo-Lucioni PP, Hopson ML, Hang D, Liang Y, Jones DP, Fridovich-Keil JL. Oxidative stress contributes to outcome severity in a Drosophila melanogaster model of classic galactosemia. Dis Models Mech2013;6:84-94. Lai K, Elsas LJ, Wierenga KJ. Galactose toxicity in animals. IUBMB life2009;61:1063-74. Batey LA, Welt CK, Rohr F, Wessel A, Anastasoaie V, Feldman HA, et al. Skeletal health in adult patients with classic galactosemia. Osteoporos Int2013;24:501-9. US Department of Agriculture and US Department of Health and Human Services. Dietary Guidelines for Americans. 2010. www.cnpp.usda.gov/dietaryguidelines.htm. Weaver CM. How sound is the science behind the dietary recommendations for dairy? Am J Clin Nutr2014;99:1217S-22S.